Moonshine Cinemas successfully released Naga Chaitanya and Samantha's Majili in the US We have successfully executed the Biggest Release of Naga Chaitanya's Career effortlessly and all the Premieres were screened ontime. 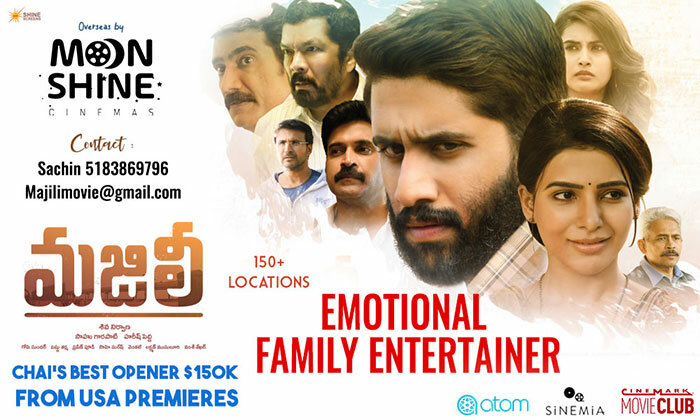 Majili has become Naga Chaitanya's highest premiere grossing film in USA as it collects $162,870 from 130 locations. With Superb Reviews and Positive Word of Mouth, the movie is expected to emerge as Naga Chaitanya's Biggest Hit in the Overseas over the weekend.